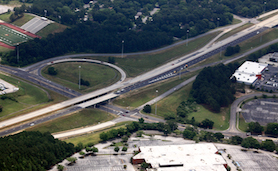 The I-20 pavement and rehabilitation project was a 9.8 mile project in the Birmingham/Irondale area which required separate closures for each direction of the interstate traffic. The work was another of ALDOT’s time sensitive projects which required the work to be performed around the clock until completion. With the required removal of approximately 2 miles of the existing concrete interstate which was removed to subgrade for re-stabilization, multiple scopes of work were performed simultaneously for most of the duration for each one of the directional shutdowns. There was approximately 42,500 CY of interstate removals performed along with bridge joint repairs, overhead sign bridges, 380,000 SY of asphalt planing, and over 220,000 tons of asphalt paving. This project was completed ahead of schedule and on budget.